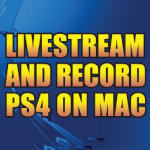 In this Live Stream I show the Easiest way to Record PS4 Gameplay on a Mac. Then I show what it looks like playing both Playstation And Playstation VR Games. This is a plug and play solution that I tested on multiple Macs using MacOS Sierra, El Capitan and Yosemite. I tested the Magewell XI100DUSB HDMI USB Capture card versus the Elgato HD 60, Elgato HD 60 S and AVerMedia Live Gamer Portable and the MageWell is definitely the best. My favorite streaming software is called GameShow. I am not sponsored by either company to say this.